Gertrude Duby Blom was born Gertrud Elisabeth Lörstcher Ritchards on July 7, 1901 in Innertkirchen, in the Highlands of Bern in Switzerland. The second daughter of a protestant priest, Otto Lörstcher and housewife Margaritha Ritchards with Johanna and Hans as her siblings – Trudi grew up in Wimmis and Bern. She was called since infant Trudi and showed, since early days, a peculiar and strong character that prompted her to become an adolescent sympathizer to the Swiss Socialist Party. By the end of the General Strike that paralyzed the country in 1918, she assisted in the creation of the Socialist Youth Group to the PSS where she was very active at the same time as she pursued a career at a school in Niederlenz. Here she practiced what would become a love of a lifetime: gardening. Not long after her degree as a horticulturist, young Trudi opted for studies in Social Work at a school in Zurich. Both studies plus the discipline she got during childhood formed her temperamental way of living. By 1921 she was a socialist activist growing in the leadership, enriching her ways by becoming a journalist, working for the party and gaining experience in London both as a militant and a press correspondent. In 1925 while in a mission in Florence she experienced her first –of five- arrests because of her political activities against Hitler and the expansion of Nazism in Europe. From 1926 to 1939 Trudi was a resistance fighter suffering no less than three incarcerations; moved from Switzerland to Germany, the Soviet Union, Italy, France, Spain and the United States of America. She was a messenger, a fundraiser, a ferocious opponent to wars in Europe and a relentless protector of victims of those wars; she wrote and delivered speeches, she wrote articles in Swiss newspapers and gave interviews outlining her views. She married twice (from her first husband Kurt Duby she adopted her family name) and was known as something of an opportunist using men of power to climb the leadership ladder within socialist ranks in Europe and the Soviet Union. By the end of 1939 Gertrude Duby was first arrested in Paris and later sent to a camp of internment for undesirable foreigners in Rieucros, south of France. Liberated by the Swiss authorities in March 1940, she left Europe for the USA in one of the many “refugee boats” sailing for freedom to another continent where she put herself to work to assist various organizations and institutions helping save victims of Nazism in Europe and from the Spanish war. While in New York, her political views took a different turn: Trudi wanted to go to Mexico especially to Chiapas and meet the Lacandon people living in the only tropical forest of the new continent. She found her way by December 1940 when she arrived in Mexico with a visa extended by then President Lazaro Cardenas. For a while she continued united to the many exiles groups in Mexico, found jobs as a journalist and a researcher –one of her famous works was the feature she did on the Zapatista Women, or the female soldiers who fought during the 1910 Mexican Revolution-, became quite famous among the socialist/communist/intellectual/bohemian/feminist circles in Mexico City. She went on many hikes to the Popocatepetl volcano and frequent excursions to nearby places to the capital of Mexico. She marvelled at the people and the nature of her new country. Little by little she made her way south. By March 1943 she came for the very first time to Chiapas and joined the first ever expedition organized by the government to find out how the Indians were doing in the Lacandon forest. From this experience she came out enchanted by the Lacandon people and the beauty of the jungle. Fate put her as well in front of a man of her liking: Danish archaeologist turned explorer Frans Blom. Life united them in a forest. By 1950 they married and settled in San Cristobal de las Casas where both founded Na Bolom, or the House of the Jaguar, a dream of Blom’s that they made into a reality: a center of academic studies on Maya civilization, hotel and museum plus their own very home. Scores of expeditions, academics, Indians and simple curious people came in great numbers to stay with the Bloms. Trudi herself became totally immersed in the lives of the Lacandon people and took the banner to save the Lacandon forest, by then prey to voracious wood eaters and natural resources merchants, corrupt politicians, illegal invaders and colonizers. In a couple of years she noticed the depletion of the forest. Where once magnificent ceiba trees stood and wild animals prowled in the House of Mayan Gods, the jungle turned into eroded forest, burnt land and a new invasion, that of cows and dogs. She took as a mission to record in photographs the natural life and the decay produced by human hands. No less than 55.000 pictures she shot during more than 5 decades in the highlands of Chiapas. From then on Trudi fought for the salvation of the Lacandon jungle. By early 1950s Gertrude Duby Blom was promoting ecological values not only in Chiapas and in Mexico, but the world around. Numerous photographic exhibitions were held in important places and she was a guest speaker in many of them. She called for action to stop the destruction of the world’s forests and sounded the alarm over the precarious life we humans were to live if the depletion of the resources continued. It may seem that she wasn’t heard, but people and organizations and governments did. Her combat against wood logging and the politicians who permitted it did not stop even when in 1972 President Luis Echeverria Alvarez decreed the Lacandon forest a reserved land and gave most of it as a property to some 66 Lacandon families. She considered the fight to preserve the beauty, riches and inhabitants of the jungle a non stop one. Gertrude lived an intense life connected to the Lacandons and the subtropical forest; she had pleasure in showing her way of life to the Swiss public opinion whenever she was in Switzerland. Books were written about her long standing fight, numerous features were published about the Na Bolom activities, photos of her protégées were known in intellectual circles, politicians and business men both loved or loathed her, but she did not mind at all. Films were shot about her life and ecological credo. She suffered enormously as did the chaman of Naha Chan Kin when noticing the commercial evolution of everyday life in the highlands of Chiapas, which influenced the attitudes and actions of the Lacandon people whom by the 80s wanted cars, liquor and cigarettes, jeans and fast food, and even worse, commercial medicaments and other religion except that of the Maya ancestry. Trudi never enriched herself from the great achievements she experienced. Both her garden and social work studies were put to good use as well as the strict discipline she got from her family. Justice was her motto. It is better understood with her quote: “we can not help others if we destroy the planet”. Gertrude Duby Blom died almost at 93 years of age. Her Na Bolom house/museum/hotel and center of Mesoamerican studies is still there, quite active in San Cristobal de las Casas. Her memory is everlasting among Lacandon people especially in Naha, at the heart of the forest. Her mission has extended into a well-interconnected family. Na Bolom Denmark, which focuses mainly on the works of Frans Blom, and Na Bolom Switzerland, dedicated to honour the life and works of Trudi; there is also Friends of Na Bolom in United States. It is for us, the new generation, to maintain and advance her ideology, to protect her patrimony and to preserve her image that can well be a role model for many women and men. 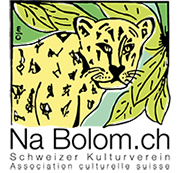 This is what the Cultural Swiss Association Na Bolom.ch aims at. Help us achieve this goal.